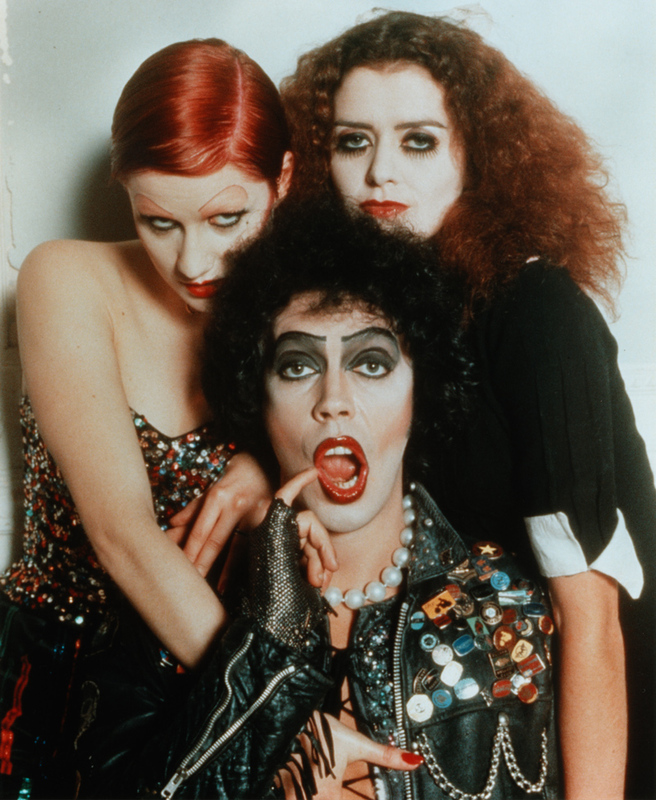 It's The Rocky Horror Picture Show, a movie that came out in 1975, with a bunch of people (that would be us, the Queerios) dressed up and acting out the film in front of the screen at the same time. We also yell and throw things from time to time (and not just when we're upset...;-). 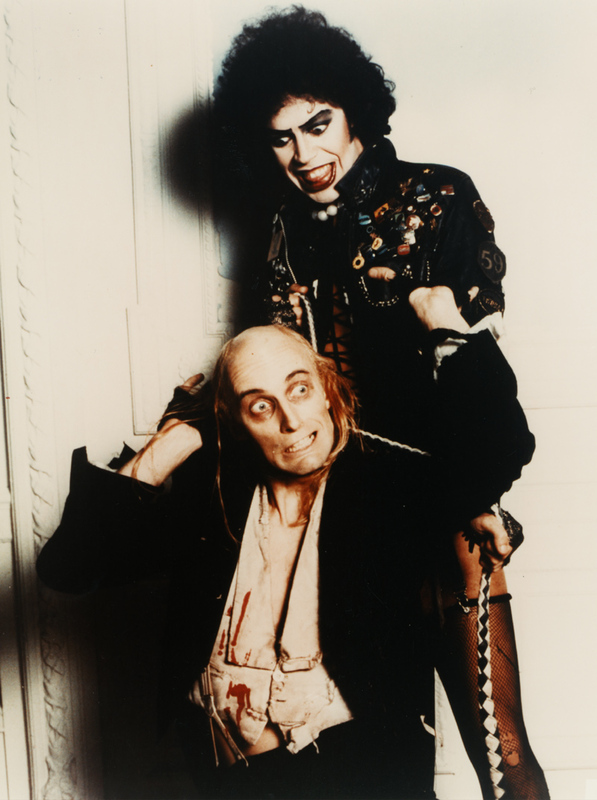 Rocky Horror is the longest continuously running movie of all time, with its unique audience participation phenomenon. If you have never seen Rocky Horror before (or at least not in an actual theater), you might take a look at James Norman's What Every "Virgin" Should Know. Dressing up is ALWAYS encouraged, whether it's as one of the characters from the movie or just wearing your best lingerie out on the town. We perform every Saturday at midnight. That's EVERY Saturday - all 52 weeks a year not including possible extra shows around Halloween. It's a near certainty that there will be a show (or two!) Halloween night regardless of what day of the week it happens to fall on. You can always check the Alamo's schedule online also. We'll occasionally do shows at other venues as well, such as the Mayborn Planetarium in Killeen, the Hippodrome in Waco, etc. The Alamo Drafthouse Cinemas are Austin's only independently owned and operated movie theaters. They serve a full menu of dinner and drinks to your seat while you watch the movie. A wide variety of beer and wine is available, in addition to other beverages. The theater is laid out like a traditional movie theater, except every other row of seats has been replaced with a long narrow table for your food and drinks. They have waiters that serve you at your seat; orders before the movie begins are taken in the traditional way. Once the movie starts if you need anything at all, there is paper and pencils at the table. Write down what you need on the paper and stand the paper up on the card holder attached to the table. This acts as a flag - your waiter will only come by if he sees the card, otherwise he will stay out of your way so you can enjoy the film. The actual movie tickets are $5.00, the Alamo's discount midnight movie rate. Tickets are also sold online if you're worried about a sellout show (Halloween for instance). Additionally I've been told that the quantity of online ticket sales determines how big of a theater we're performing in, on any given weekend. Prop bags are sold when available by the cast for $3.00 each (or two for $5.00). Prop bags generally include newspaper, glowstick, rubber glove, noisemaker, toilet paper, party hat, playing cards, Mardi Gras beads, and a condom. We also have cast t-shirts available for $15.00 each. Donations to the cast are always greatly appreciated, as they help us pay for lighting equipment, costumes, props, advertising, and other incidental expenses. Remember...none of us get paid a dime for this! Newspapers, rubber gloves, party hats, noisemakers, toilet paper, and cards are allowed and encouraged (not to mention usually included in the prop bags we sell!). Basically you may bring anything you want except for food (including rice and toast), water, fire, or confetti. Food attracts rodents, water ruins upholstery (not to mention helping to grow mold), fire makes the Fire Marshal and insurance people extremely nervous, and confetti means that the cast will have to spend a full hour after the show vacuuming it all up (gah!). Feel free to use glowsticks or flashlights instead of fire for "There's A Light".